As noted by iPhoneinCanada.ca, Google today added its Street View functionality to the web-based version of its Google Maps product available to iOS and other mobile device users. 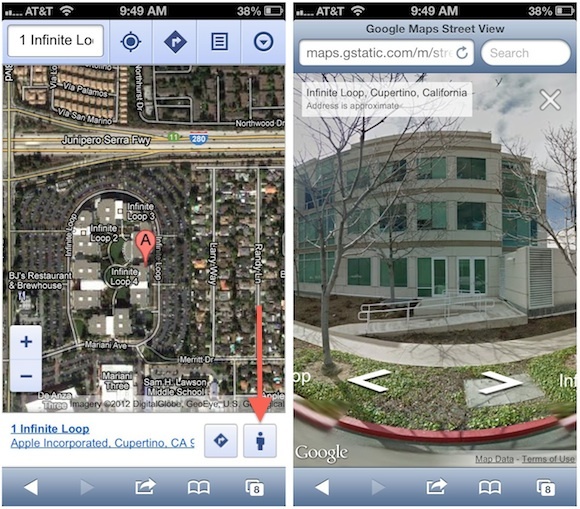 With Apple's transition to its own Maps app in iOS 6, users still wishing to use Google Maps have been able to do so through the maps.google.com web app, but the web version has been missing some features compared to the native iOS app that was previously available on Apple's devices. Our own tests with Google Street View via the Google Maps web app were very straightforward. Just load up the maps.google.com web app in mobile Safari, tap on a location and a new bottom bar emerges with an icon of a person. Tap that and voila–you have Street View, which opens up in a new tab displaying the URL maps.gstatic.com. Access to the feature appears to require that users allow the web-based Google Maps app to access their locations. Google is reportedly working on its own native iOS maps app for submission to the App Store, but that app is not expected to be ready for several more months. In the meantime, Google appears to be beefing up its web-based maps to help bridge the gap while also enhancing functionality for other mobile devices. Another useless app that chews lots of data and requires a data connection to work. You do know that Apple Maps requires a data connection too, as well as kills your battery when you use it. Or are you bashing that as well? Making a shortcut to the maps.google works better than I thought it would. It doesn't lag in Safari as much as I thought it would. Actually, you are wrong. Apple Maps does not need data. The map is self contained in the app, it just needs a GPS signal. This is not true. It will only show cached data. You still need a data connection to zoom into places you have not viewed before yet. I prefer to wait for the app. Do you have a source for this? As far as I can tell it pulls the maps from the Internet. When I poke around in Airplane mode it doesn't show much for maps. Some basic cities are there if I zoom out but if I zoom in there isn't much of anything. How the heck do you drop a pin reliably on the web app? Sometimes I can drop a pin, other times it ignores my tap. This is the single biggest problem with the web app at the moment. Everything else seems to work great, if not as pretty as the old app was.